1974 – 1976 Engineer-Cadet with Cayzer-Irvine & Co Ltd, British & Commonwealth Shipping. Sponsored for part of H.N.D. Mechanical Engineering studies which included intensive academic study and practical training. 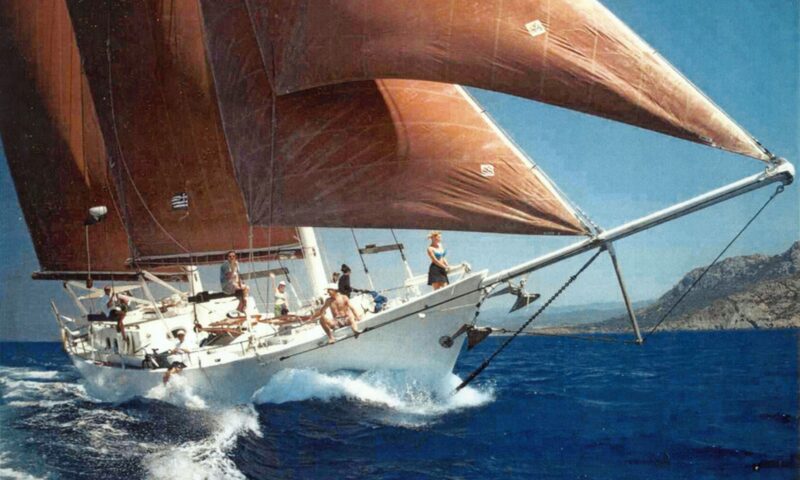 1976 Chief Engineer responsible for refit and major modification to 100 foot squaresail ketch involving up to 20 crew/shipyard craftsmen in Italy. 1976 – 1978 Continuance of self-sponsored H.N.D. Mechanical Engineering studies. 1979 – 1980 H.G.V. Class 1 training/driving and car building. 1980 Master of new steel Doggersbank 1930 motor yacht (75 tons) during final stages of completion, including problem solving, progress chasing, liaison with owners, designers and shipyard, trials and short tours. Up to 23 Dutch/German craftsmen and specialists of all calibres working at any one time. Value of contract £0.75m. ~1981 Drove from the UK with a caravan to donate to Italian earthquake disaster. 1981 Master of Moody 52 motorsailor. Joined vessel at Malta, left at Hamble. 1982 Buyer for Thew Engineering; a company employing 200 engaged in all types of engineering work: marine, mechanical, fabrication, welding, petro-chemical & precision work etc. 1982 Thermal Equipment Engineer for Foster-Wheeler Energy Ltd in Reading. Control of design, review and co-ordination of heat exchangers for Swedish oil refinery including 15 aircoolers and 25 shell & tube type exchangers including liaison at all levels. 1982 – 1983 Property Investment: Bought first house in Reading, living in one room and letting out six further rooms. All repairs and renovations were carried out myself. Southampton for the purposes of letting (6 units). Considerable renovation work carried out. 1985 – 1986 Property Investment: Letting & development. Bought another house in the city centre; let out as 6 units. Later totally rebuilt the house and sold to homebuyers. 1986 Master of “Gabel”, Technomarine 77 motor yacht. Dec’86 purchased 2 houses from local Council in derelict state. Rebuilt for letting using sub-contract labour force. Let as flatlets (8 units each). 1988: After applying for planning permission to convert one house into 4 maisonettes, purchased 2 houses during the year for development into 5 bedroom executive type homes in rural locations. All plans carried out by self and plans passed by Southampton, Eastleigh and Winchester planning authorities. 1989-91: Development properties sold off during recession, reversion to letting only henceforth. Conversion of remaining let properties to completely self-contained units to aid management and income. 1992: Developed letting agency and property investment consultancy. 1993: Remaining properties sold. Letting agency and property investment consultancy set up. 1994 Bought two properties for cash as investment. Plans to make purchases at auctions and renovate to let. 1994 Spent one month leading a voluntary team to India to work on a leprosy mission hospital. 1995: Various periods of voluntary work aboard ‘Morning Star of Revelation’ – a 62-foot gaff ketch based at Chatham Dockyard. May – August: S V ‘Silvery Light’ 1884 making a film about Sperm whales for the BBC in association with ‘National Geographic’. Direct Employer: David Redhead & Caroline Robins. S Y ‘Silvery Light’ 1884. c/o T. Nielson & Co, The Repair Yard, Gloucester Historic Dockyard, Gloucester. Fax: + 44 1452 410056. Owner: Mr Les Alderman, Warleigh Manor School, Bathford, Bath BA1 8EE. Sailed aboard T S ‘Royalist’ as relief. Direct Employer: Capt John Paling c/o Mrs Barbara Hoyle, Offshore Commanders Office, Sea Cadet Corps, Fort Blockhouse, Gosport, Hants. PO12 2AB Fax + 44 23 9252 7224. Skippered ‘Eagles Wings’ and ‘Jehovah Jirah’. 1999 – 2004 Bought 6 properties at auctions as investment. 2001 – 2002 Ran 2 ex-pilot boats engaged in firing range safety control, surveys and water sampling work. SBE Engineering, Whitehaven, Cumbria. 2005 Organised delivery of S.Y. ‘Four Sisters’ for ex-international rugby player with a terminal brain tumour. The yacht required extraction from Morocco where the yacht was being held, considerable repairs and final delivery to Ireland via Wales. Arranged permanent loan of vessel to sail-training trust and sail-training trips. 2006 Renovating, developing and selling properties. Short trips on sail training vessels. Providing support for a new Christian Retreat Centre in Wales and a number of other charities by email and fax worldwide. 2007 Captain of S.Y. ‘Sh’khinah’ in conjunction with YWAM from New Zealand and cruising the Fiji islands. 2009 Captain of S.Y. ‘Southern Cross’ – a Maxi 88 in Turkey. 2010 Captain of S.Y. ‘Seahawk’ – a 1969 Hood 53 used for outreach around the South Pacific including, Samoa, Fiji and Vanuatu. We sailed with a total crew of 7 many of whom changed during the year covering approximately 4000 miles. I worked for the trustee Roger Bolam who was on board most of the time. Wide range of in-depth technical qualifications and experience. Major engineering thesis completed entitled: ‘Piston Ring Analysis’. Marine Studies projects on: ‘Sea Survival’ and ‘Collisions at Sea’. Shipping company study on ‘RSL Planned Maintenance System’. Automotive engineering: complete knowledge and experience on all aspects, possess compressor & paint spraying equipment, own gas and arc welding equipment. Built own car. Light & medium marine engineering (small vessels): handling of all types of vessels up to 137 feet under sail and 163 feet under power. Heavy marine engineering (deep sea): full Chief Engineer D.T.I. 1st Class Certificate of Competency exemptions. Basic languages include French, Italian, Dutch, German & Portuguese. Sailed as Captain or Captain/Engineer on motor and sailing yachts of both high speed and heavy displacement types built of steel, wood, GRP, aluminium, composite construction, Kevlar and ferro-cement. Have also extensively sailed traditionally rigged vessels and been involved in supervising and coordinating new builds and major refits.